A war of words has erupted in Southeast Asia as rampaging fires and choking smoke plumes stoke regional tensions between Indonesia and its neighbors. Dense smoke from agricultural fires in Indonesia have forced flight cancellations and school closures across the region, as diplomatic tensions heat up. Singapore has slammed "shocking" statements from Indonesian officials who made light of the crisis. In return, Indonesia accused Singapore of being "childish". Dramas over choking smoke have become an annual soap opera in Southeast Asia as Indonesia continues to raze its forests. Singapore is now taking legal action against major corporations, including the massive pulp producer Asia Pulp & Paper, that are regarded as key drivers of forest and peatland loss in nearby Sumatra, Indonesia. In response, Indonesian president Joko Widodo said the recurring fires and smoke were a long-term problem and would require time to be solved. 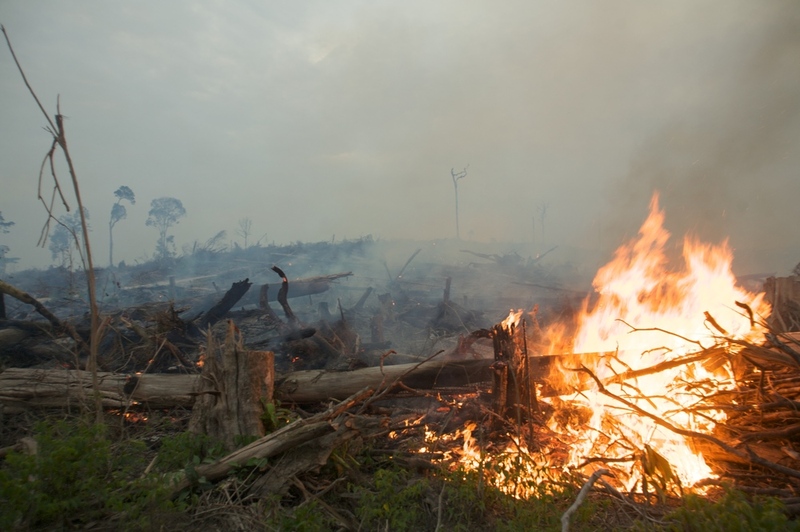 Fires are used as a quick and cheap way to clear forests and peatlands, with massive forest clearing underway on the islands of Sumatra and Borneo. Native forests are being destroyed for oil palm and pulp plantations, and for slash-and-burn farming. Since 1997, mega-fires have become a virtually annual event each dry season. A strong El Niño drought this year -- called "Godzilla" by some -- is increasing rainfall deficits across Indonesia and elsewhere in the western Pacific region. The fires and smoke are rapidly worsening. In Indonesia, Malaysia, and Singapore, air quality has hit hazardous levels, tens of thousands have suffered respiratory illnesses, numerous flights have been cancelled, and schools have been closed. Last week, Singapore's air pollution index hit hazardous levels, prompting officials to close all schools and distribute protective face masks. Schools were also closed in the Malaysian capital of Kuala Lumpur. Satellites detected more than 2,000 fire "hotspots" last week in Sumatra and Indonesian Borneo. As fires increase, officials in neighboring countries are growing increasingly frustrated. Singapore has arrested seven corporate officials and suspended the business licenses of four corporations that are headquartered there. Although many fires are started by small-scale farmers, large corporations are also responsible for burning both directly and indirectly. By building new roads and exploiting large areas of native forest, corporations open up many areas to new human pressures. Indonesia could and should enforce a major fire ban, but it would require a concerted effort on the part of the Widodo government. Widespread corruption in the region is hindering efforts to enforce existing restrictions on fires and forest clearance. Until the raging fires and smoke are brought under control, expect more hot words from Indonesia's increasingly frustrated neighbors. Southeast Asia is accustomed to intense smoke and haze from forest burning, but in June 2013 air pollution reached the highest level ever recorded -- hitting life-threatening levels in Singapore, for instance. This alone was scary enough, but there is an even more frightening side to the story. Unlike virtually all previous mega-fire events in the region, the June 2013 fires didn't occur during a drought. That is unprecedented. Even in a year with normal rains, fires -- especially in central Sumatra, where forests are being devastated for oil palm, pulpwood plantations, and slash-and-burn farming -- raged out of control. New research by David Gaveau and colleagues -- which you can download free here -- has uncovered an alarming explanation for this new fire dynamic. Previous degradation and burning of forests is making them hyper-vulnerable to new fires, even during relatively wet conditions. Gaveau surveyed the aftermath of the Sumatra burning and found that much of it was caused by slash-and-burn farmers. And most of the burned land was degraded forest or peat-swamp that had already been burned once before. The previous burning left behind dead and dying trees, stumps, and slash that became highly flammable with just a few days of dry weather -- unlike an intact rainforest, which only becomes flammable after a prolonged and intense drought. Gaveau calls these degraded areas "forest cemeteries" -- places where damaged, regenerating forests become prone to a final, fiery death -- and spewing out massive quantities of greenhouse gases in the process. Central Sumatra has become a poster-child for forest devastation, and now this new research shows that its damaged forests are far more prone to killer fires -- fires that can also have a lethal impact on human populations living in the region. Warning: Do not look at this map if you don't want to feel depressed. The image shows how much of Borneo's biodiversity-rich forests have been destroyed or degraded in the last four decades -- and it's enough to ruin anybody's breakfast. From 1973 to 2010, the tropical rainforests of Borneo have been razed twice as fast as those elsewhere on the planet, according to a freely available study that just appeared in PLoS One. In the paper, David Gaveau, Sean Sloan, and colleagues analyzed Landsat imagery to see how much of Borneo's mega-diversity forests have been cleared, burned, or degraded by industrial logging. It's not a pretty picture -- as also detailed here in the leading environmental website Mongabay. In 1973, more than three-quarters of Borneo was blanketed by native forest, much of which was undisturbed or little disturbed, according to the study. By 2010 nearly 17 million hectares of the forest -- an area larger than England, Wales, and Northern Ireland combined -- had vanished. Echoing an earlier study that spanned all of Indonesia, industrial logging, oil palm, and wood-pulp plantations were apparently the biggest culprits, along with slash-and-burn farming. Increasingly, large expanses of Borneo are dominated by selectively logged native forests. As highlighted previously here at ALERT, these forests still retain considerable biodiversity and carbon, but are intensely vulnerable to being cleared or burned. The challenge at hand for Borneo is clear, the study concludes. It's vital to slow forest destruction, by safeguarding existing protected areas and especially by defending the selectively logged forests that now increasingly dominate the island. Four hundred million hectares--an area bigger than Mexico and Indonesia combined. About the size of the Brazilian Amazon. That's how much of the world's tropical forests are being selectively logged. Unfortunately, these logged forests are intensely vulnerable to being cleared for oil palm, slash-and-burn farming, and other land-uses. In the past, biologists have often emphasized the negative impacts of logging on biodiversity. But a growing body of evidence shows that even heavily or repeatedly logged forests still retain most of their species and ecological functions. That's a vital conclusion because it underscores just how valuable these logged forests are. In a recent editorial, ALERT director Bill Laurance and his colleague David Edwards argue that protecting logged tropical forests should be very high on the agendas of conservationists. With the rapid decline of old-growth tropical forests, retaining logged forests--and devising economically viable ways to manage them over the long term--are key priorities for the future. Is 'killer smog' returning to Southeast Asia? The 'killer' smog that has often plagued Southeast Asia might be coming back. Fires are burning across central Sumatra, Indonesia, where thousands of people are in respiratory distress and a state of emergency has been declared. Around 1500 fires, mostly illegal, have been detected in Sumatra's Riau Province alone. The fires are attributable to an early dry season, rampant land-use change, and little government control over forest burning. In past years, such fires have blanketed much of Malaysia and Singapore in a dense smog, creating a health hazard for millions of residents--many of whom don face-masks when venturing outside. The fires are being mostly blamed on forest clearing for oil palm plantations. Indonesia is being faulted for failing to ratify an ASEAN agreement to monitor and combat forest fires and for not publicly releasing maps showing which companies own the lands being burned.